Don't tell her what it was like. Don't tell her how you had to dig your way out through heavy layers of clay to reach the fresh air, because that would distress her. Don't tell her about the box, because that would confuse her. And don't tell her about the light, because that was sacred. Lately cannonballs have flown their arcs, leaving the crystal sky unbroken, while on Earth their traces are all too visible. Yet though Heaven has never seemed so far away, the divine is terribly closer. War on Earth presages War in Heaven; the struggle between the holy houses of Christ and their eternal Adversary has erupted among the living. 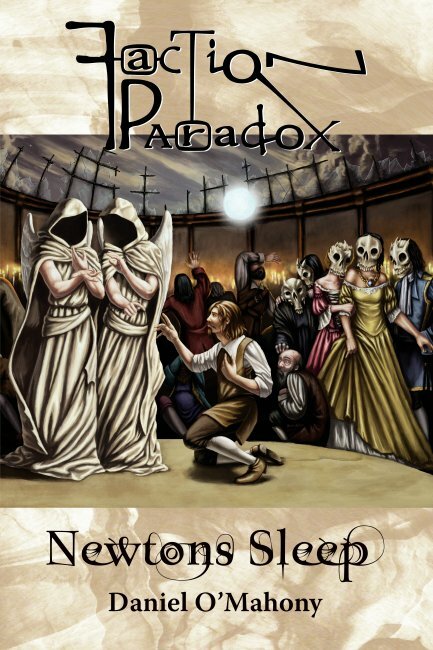 Newtons Sleep by Daniel O'Mahony is the first Faction Paradox novel to be released by Random Static. Though set in and building on the Faction Paradox universe, it is a completely self-contained story that does not require any familiarity with previous Faction publications. Daniel's other works include the critically acclaimed novella The Cabinet of Light, contributions to Faction Paradox: the Book of the War, and the novels Falls the Shadow, The Man in the Velvet Mask, and Force Majeure.